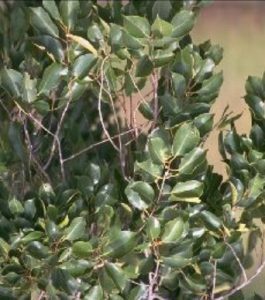 Syzygium guineense is a medium-sized or tall evergreen tree, 15-30 m high. The bark varies in subspecies and is greyish-white or silver mottled and smooth in young trees, turning rough, flaky, creamy, light grey, dark brown or black in older trees. Bark scales in rectangular flakes and produces red, watery sap if cut; slash is fibrous, even pale brown to dark red-brown. Branchlets sometimes drooping. Crown rounded and heavy; stems thick and angular. Bundles of fibrous aerial roots, about 2 m up the bole, have been observed in Botswana.